The Stop Veolia campaign in Seattle launched a 101-page Zine documenting Veolia’s criminal anti-labor, anti-environment, anti-poor practices, alongside popular victories against Veolia in Paris and Palestine. Veolia, the largest privatizer of water globally, the largest privatizer of transportation in North America, until recently one of the main profiteers of Israeli apartheid and a company that can be traced back to Napoleon, helps us to trace the roots of today’s neoliberalism in earlier manifestations of Western imperialism and exploitation. 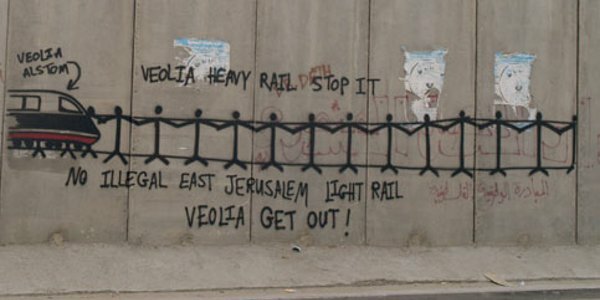 Palestinian civil society activists have heralded the decision by French corporate giant Veolia to sell off nearly all of its business activity in Israel as a huge victory for the global Boycott, Divestment and Sanctions (BDS) movement.